High performance, lightweight, compact one-person total cooking solution. 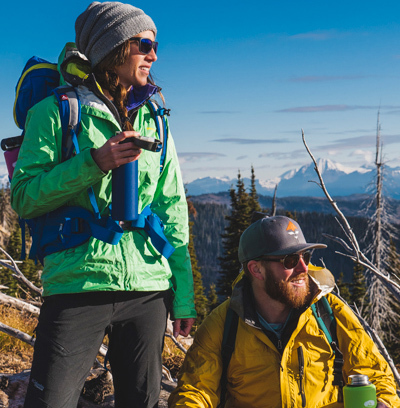 Including our Pinnacle lightweight, high output stove and integrated windscreen along with insulated mug and Foon for one person providing superior efficiency and flexibility in an ingenious space efficient package. CAUTION: Never heat nFORM Ultralight cookware to extreme temperatures or allow it to boil dry. Pot and lid intended for camp stove top use only. Not for use with microwave ovens, conventional ovens or open campfires. Pot, stove and windscreen will become extremely hot when cooking. Always use caution when using gripper. Never expose gripper or lid to direct flame. Do not attempt to separate mug and sleeve or mug and lid while full. WARNING: Prior to initial use, always wash with hot water and mild detergent at home and dry immediately. Use only non-abrasive cloths and cleaners. Always allow components to dry completely before storing. Microwaves and dishwashers may prematurely age components. nFORM Ultralight Cookware and Tableware is not intended for prolonged storage of food or liquids. DANGER: This stove is for OUTDOOR USE ONLY. Never use this stove in a tent, vestibule, vehicle, house, or inside any enclosed area. This stove produces deadly carbon monoxide gas which has no odor. Improper use of this stove can result in suffocation, poisoning or death. This stove can easily ignite surrounding materials and flammable liquids or vapors. Keep stove and cartridge away from other heat sources. Steam will vent through lid during use. Always point vents away from stove controls and self while cooking. Always hold Lid securely against the pot when pouring. Do not attempt to rapidly cool nFORM Ultralight Cookware. Stove, windscreen and components will be VERY hot for a period of time after shutting off. Never attempt to remove or compact the stove or windscreen while hot to the touch. Doing so can quickly result in severe burns and possible ignition of flammable materials. Keep children and pets at least 10 feet (3+ meters) away from the stove. Always respect fire and all other hot substances.